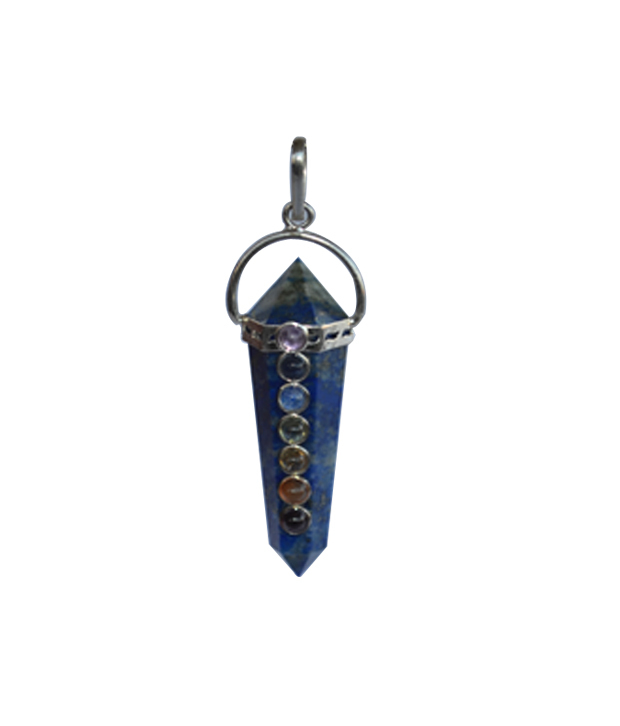 These Energized Semipricious Lapis lazuli is made up of 25 to 40 percent laurite, plus several minerals (sodalities, Haynes, calcite, and pyrite) that influence color and its distribution Excellent Dark Radiant Blue natural, Lapis Lazuli pendent. .it helps in Understanding the mind. Expanding your viewpoint. It is good for connecting the heart and the mind when worn over the heart , was treasured by ancient civilizations. In Tibetan Buddhism, Lapis Blue is associated with the "Medicine Buddha." Lapis was traditionally ground into a powder pigment and used in Tibetan Thangka Paintings (Sacred Art). The Chakras are the seven power points in the human body that circulate energy or the life force also known as prana. Wear this pendant to clear the energy flow of the chakras. This gorgeous pendant is set with 7 cabachon or faceted chakra semi precious stones on a smart silver colored setting. The stones (from top to bottom) are: • Amethyst - Crown chakra • Iolite - Third Eye chakra • Aquamarine - Throat chakra • Peridot - Heart chakra • Citrine - Solar Plexus chakra • Carnelian - Sacral Hara chakra • Garnet - Root chakra Disclaimer: This Fengshui Product is Believed to bring about all the good things. We do not guarantee its success and are not responsible for any claim. Product colour may slightly vary due to photographic lighting sources or your Screen settings.